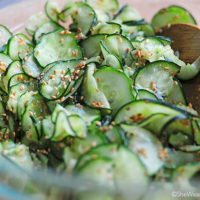 This tasty Wasabi Cucumber Sesame Salad is simple and a great way to use that supply of summer cucumbers. The first cucumbers of this growing season were harvested here last week, with more on the way. Fresh, crunchy cucumbers are always a welcome sign of good summer eats, although I was ready to try something new with the trusty vegetable. I wandered the grocery produce section trying to decide what to pair with the cucumber that wouldn’t be so boring. My brain was blank. I was totally blocked, with no prepared list on hand. But…I did have some apps in my purse. Apps that I had never used. Apps that I thought I just had to have. Apps with so much promise crammed in that tiny little square. So right there, I thought I’d finally try one of those many apps to see if there were any unique cucumber options. The Epicurious app came to the rescue. I was able to type in “cucumber” in the ingredients search, and up popped a slew of tempting cucumber options, right there on Aisle 2. Totally nifty. And it was easy to use the first time. I felt so high-tech. Surely people were watching, amazed at my fancy shopping list. It felt like I was driving a new car. So, with a plethora of cucumber options at my fingertips, I scrolled and scrolled, and landed most surely on Cucumbers with Wasabi and Rice Vinegar. Done. Searched and discovered in less than 30 seconds. For the wasabi, I used prepared wasabi. You can find it in a tube, packaged in a small box at most groceries. Of course, you can always mix your own wasabi. Mix the wasabi with a few other ingredients. Toss it all together to coat well, and that’s it. Almost as easy as an app. Enjoy! A super simple salad that is crunchy, zesty and spicy, and with the addition of toasted sesame seeds, a little nutty too. 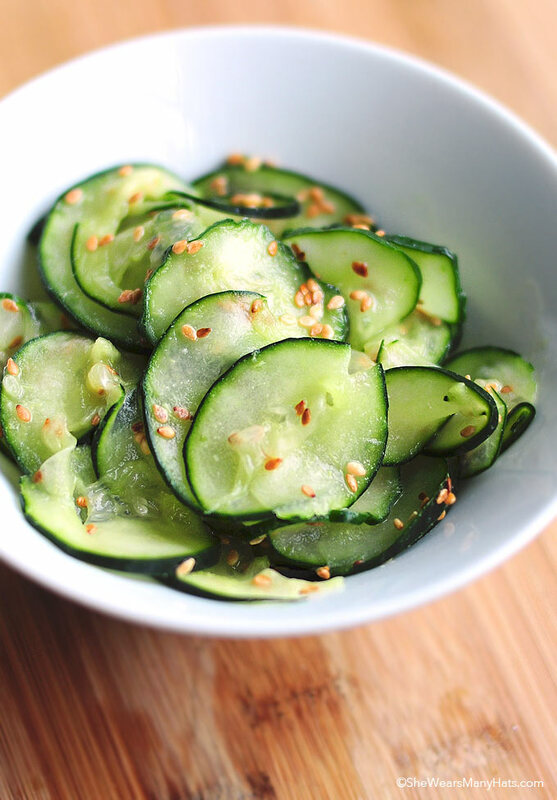 In a colander spread sliced cucumbers out and sprinkle with 1 teaspoon of salt. Let stand and drain for about 15 minutes. Gently squeeze out any excess water and add to bowl. 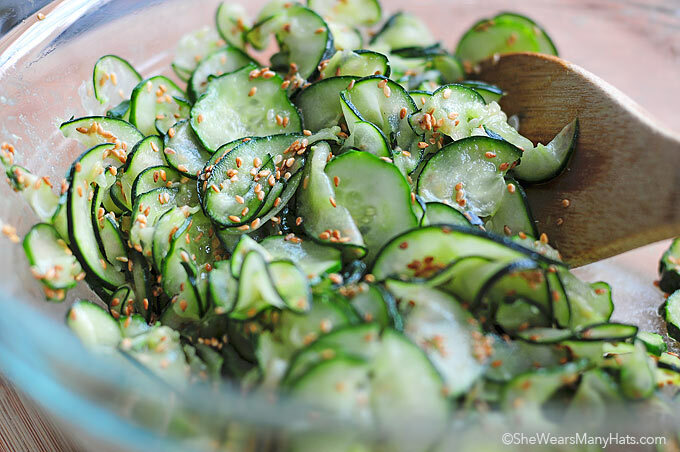 While cucumbers are draining, toast sesame seeds in dry pan over medium, until browned, stir/toss occasionally. About 5 minutes. Mix together vinegar, wasabi, soy sauce and sugar. 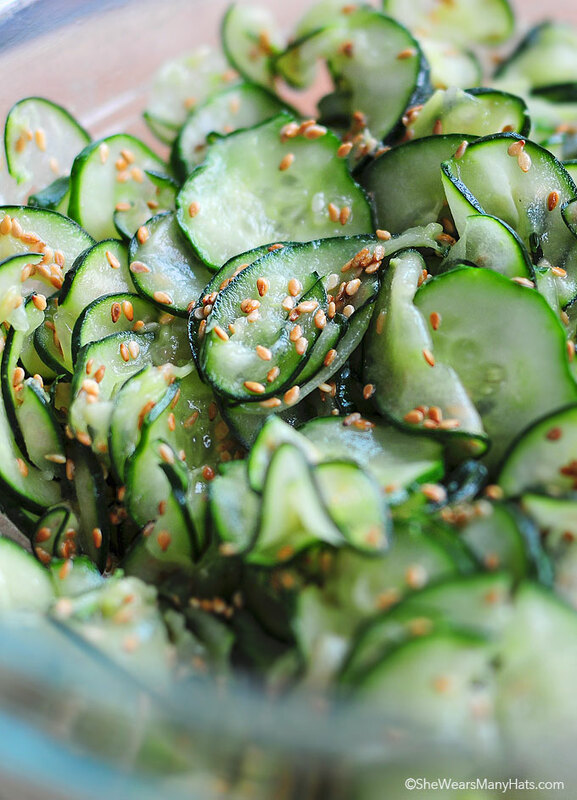 Toss cucumber, sesame seeds and wasabi mixture until combined well. Originally published June 5, 2011. « Previous PostA different kind of dream vacation. Those cucumbers look and sound wonderful. Will have to try that one. The app of choice right now is Words with Friends. It’s like scrabble that you play with other people. You can play with friends, or with random others. I play with my husband, daughter, brother and nephew. it’s fun. Some games take days, but you just play your turn when you get a chance. It has bugs, but they aren’t bad enough to get me to stop playing! Oh my, that looks yummy! Our cucumbers haven’t started coming in yet, but not because I’m not watching them like a hawk or anything. Looks so light and refreshing! I just made a similar salad with our first cucumbers. Instead of wasabi, I added some fish sauce and lime juice. Love dishes like that this time of year. Look at all those beautiful pictures!! And what a fun and creative salad… great job! Now that looks good! Refreshing, light and a little spicy – just up my alley! the cucumber slices look so pretty !!! I will have cucumbers from my garden in the next couple of weeks. This is a great salad idea (I love wasabi). Can’t wait to try it! This is def something new to try! A seriously great combination of flavors. I love the heat of wasabi. Mmmmmm, these flavors sounds heavenly together! Love wasabi! When I was in NYC, I used the Urbanspoon and HopStop apps. They find restaurants that are near where you are and show you reviews and walking directions to get there. Made things WAAAAAY easier. I love all of the flavors in this salad. I can’t wait to try it! YAY FOR APPS!!! and love the salad! Yum! I always forget about using wasabi but this looks so good and easy for a hot day. Thanks for the idea! Wow, this looks awesome. I’ve got to try it – and I will probably do so this week. Were there any leftovers? (i.e., how does it hold up in the fridge if I want to make it in advance). It held up in the fridge well. My husband actually liked it better after it was refrigerated for a while. With the vinegar and sugar it definitely is more of a pickled salad after it sits a while. Hope that helps! Looks delicious! Your pictures are AMAZING! I love the idea of the wasabi with the cool cucumber! I have a mandolin, cucumbers, sesame seeds and even some old wasabi I believe (my only concern being that it is too old…and that means it is REALLY old!). Love this…it is a must try. Cucumbers are my favorite vegetable (I know..I’m weird). And I’m always looking for new ways to dish ’em up. This recipe sounds FAB Amy. This looks [& sounds] delicious! 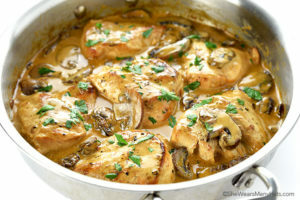 Definitely need to give this recipe a try – thank you for sharing! This is delicious, I have never tried adding wasabi to mine’s I will try that tonight..
Wow – sounds fantastic. And guess what? I just happen to have a tube of wasabi just waiting for some cucumbers! Cucumbers of any variety are a staple in our house, my husband is obsessed! I love asian flavored versions too, he’s going to flip over this one. I make a version but didn’t think to include the wasabi, love that idea. And love my iPhone for the same reason as you—handy when you’re in need of inspiration! Thanks for posting! I just made this and it was delish! Thanks, now I have something healthy, crunchy, salty and spicy to take with me to work on those horrid hot summer days! I made IT. Wonderfully delicious. This blows my mind! Making it tonight. Might have to have sushi on the side yum yum yum.